Does smaller have to mean less useful or lower quality? Not always. There are definitely instances where companies make their smaller offerings to the exact standards and specifications that larger models are subject to. 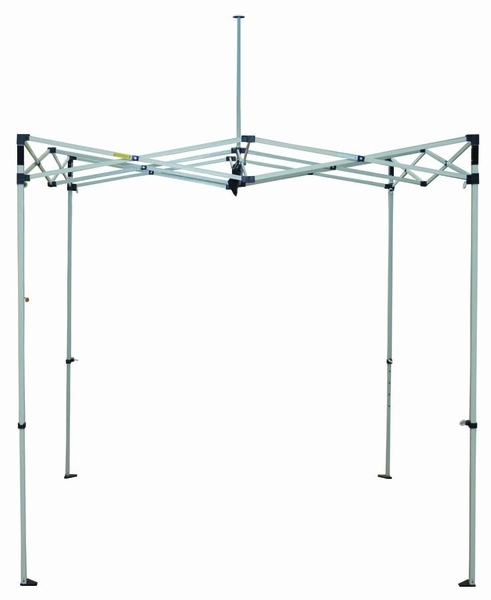 The Caravan Displayshade 5 X 5 Canopy with Professional Top represents one of those situations. It's exactly like its bigger brothers in terms of quality and construction, just in a more diminutive package. 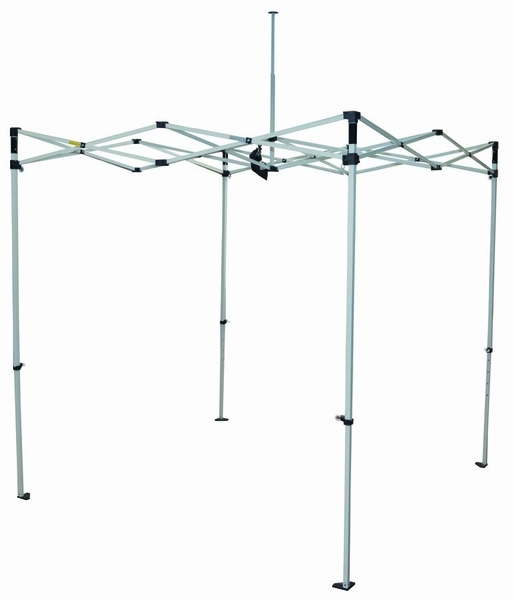 In terms of overhead protection, this tent offers a professional grade 500 denier polyester top. This top is wind-resistant, fire-resistant, and UV-resistant. 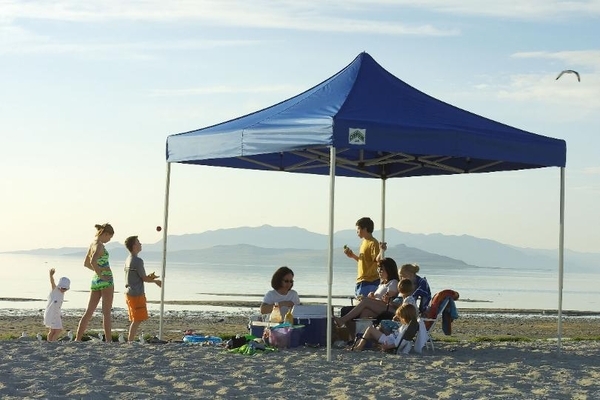 This last designation is important because, unlike many canopies you'll find, this top provides you and your guests with nearly total protection from the sun's rays. That's important for the long-term health benefits and for the fact that blocking nearly all UV rays means that the area beneath the tent stays consistently cooler than you'll find in less protected models. The frame on this unit provides a lot of benefits, too. The lightweight steel construction makes for a sturdy, stable base when providing protection for nearly any picnic or outdoor excursion. The pop-up nature of the design makes setup and takedown a breeze, and five available height settings give you a lot of options as to how you set up the tent for all sorts of different activities. Pull-pin height adjustment, superior UV protection, and simplicity of setup are some of the main features this canopy brings to the table. There are plenty of others, but these are the real calling cards of this model outdoor shelter. Smaller stature, big quality, and top-level function are what this product is all about. If value, flexibility, and overall quality are highest on your list, then the Caravan Displayshade 8 X 8 Canopy with Professional Top is an excellent choice. WARNING: This product can expose you to chemicals including Diethylhexyl Phthalate, which is known to the State of California to cause cancer, birth defects, or other reproductive harm. For more information go to www.P65Warnings.ca.gov. 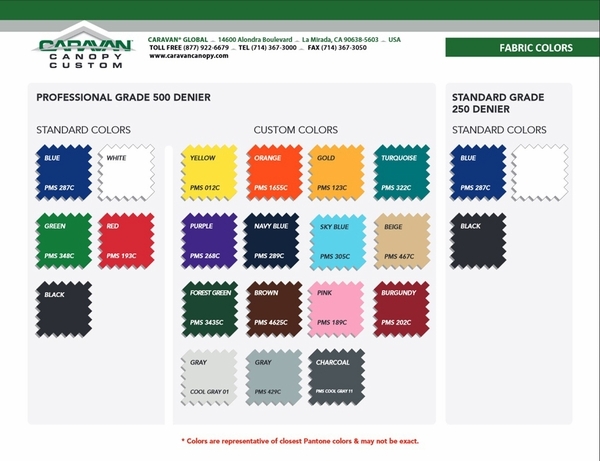 Custom Colors Available in Gold, Black, Navy Blue, Turquoise, Orange, Grey, Yellow, Purple, Pink, Brown, Burgundy, Forest Green, Camouflage, Sky Blue, or Beige. There will be an additional charge for these custom colors. Are side walls available for the 5x5? I am looking for a small canopy with 4 walls and zipper front entry. Yes, you can purchase both solid side walls and side walls with a middle zipper.